I wish I could go to this! The grand opening of the new William H. Gross Stamp Gallery at the Smithsonian's National Postal Museum is Sunday, September 22nd. It is the world's largest stamp gallery and the only one to show stamps and mail in the context of American history and culture. Among display will be like a cover postmarked on the moon in 1971, and a watch worn by a sea clerk aboard Titanic. You'll be able to see a letter addressed to John Hancock postmarked July 4, 1776 and the world famous Inverted Jenny, along with other stamps from America and around the world. Lots of fun for the whole family too! Check out the list of awesome activities for kids. There's everything from a Bugs Bunny meet and greet to a scavenger hunt. Ben Franklin will also be there himself to pose for pictures. Anyone out there planning on attending this? I really like to spend time in galleries and with great pleasure and interest to visit this place. I like the idea of opening the gallery of this type. You know, it would be really good if you'll add some more photos from the gallery. That's great. Thank you for sharing those materials here. I hope that you'll add something that unusual and educative later. 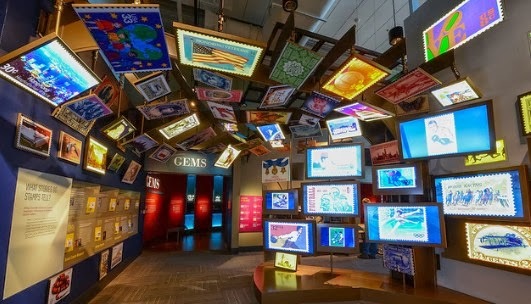 The world's largest stamp gallery is intended to show stamps in the context of American history and culture. How can I attend this Gallery? Where we can see the collection?